Aside from the Wilderness Areas listed below, North Carolina is also home to five Wilderness Study Areas. Click here to learn more about these areas! Map by Bill Gupton. Click for larger image. Photo by Panoranio user carolinius49. Click to view original. All rights reserved by owner. The United States Congress designated the Birkhead Mountains Wilderness in 1984 and it now has a total of 5,025 acres, all located in North Carolina. Covered primarily in old-growth hardwoods, the Wilderness consists of several long, wooded ridges and surrounding drainages of moderately steep terrain. Small, clear streams run past rocky outcroppings down to the Uwharrie River and outside the western boundary. An understory of wildflowers, shrubs, ferns, mosses, and other plant species flourish on their sodden banks. Elevations range from about 450 feet on drainage bottoms to around 950 feet on Cedar Rock Mountain in the northeastern section. Click here for more information about the Birkhead Mountains Wilderness Area through Wilderness.net. We need a picture of Catfish Lake South Wilderness. Got one we can use? Send it to dustin.chicurel-bayard@sierraclub.org. Croatan's Catfish Lake South Wilderness has a total of 8,530 acres and is primarily raised bogland, where biting insects try to steal the spotlight from the American alligator and the cottonmouth, canebrake rattler, eastern diamondback rattler, pygmy rattler, copperhead, and other poisonous snakes. Five genera of insectivorous plants live here, a combination rarely seen elsewhere: the erect pitcher plant; the hairy, sticky round-leafed sundew; the waxy, "buttery" butterwort; the hinged-leafed Venus flytrap; and the aquatic, floating bladderwort. You may see deer, bears, squirrels, rabbits, and raccoons, all of which may be hunted according to state law. Click here for a map of Croatan National Forest showing Catfish Lake Wilderness and other areas! Click here for more information about the Catfish Lake South Wilderness Area through Wilderness.net. Photo credit: wilderness.net public archives. 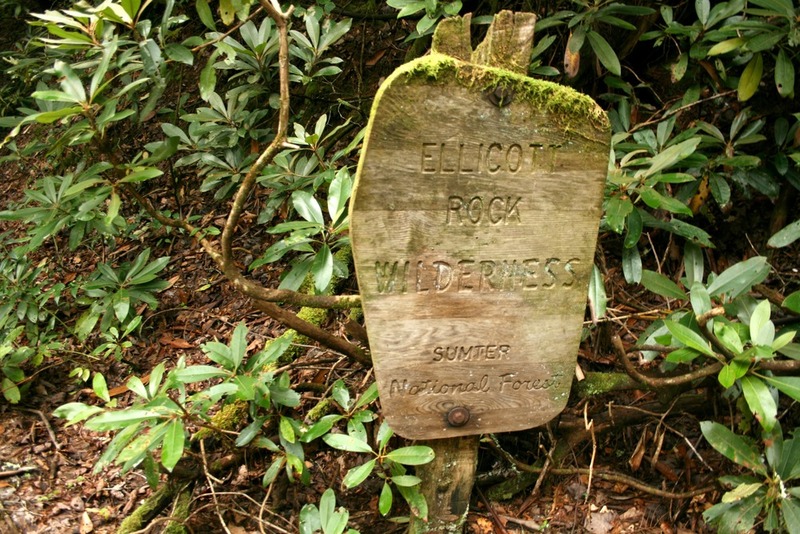 The Ellicott Rock Wilderness has a total of 8,274 acres, with approximately 3,394 acres in North Carolina, 2,021 acres in Georgia, and 2,859 acres in South Carolina. In 1811, surveyor Andrew Ellicott determined the starting point for the North Carolina-Georgia state line and chiseled an inconspicuous mark on a rock on the east bank of the Chattooga River. Here the mountainous regions of South Carolina, North Carolina, and Georgia converge, and this is where the Ellicott Rock Wilderness straddles the Wild and Scenic Chattooga River. Click here for more information about the Ellicott Rock Wilderness through Wilderness.net. Photo credit: Jeff Moore. All rights reserved by owner. Photo labeled for non-commercial reuse. Designated by Congress in 1964, the Linville Gorge Wilderness has a total of 11,786 acres, all located in North Carolina. From its headwaters high on Grandfather Mountain, the powerful Linville River patiently carves the rugged, steep-walled gorge that encloses it for approximately 12 miles. Within the gorge, the river drops a dramatic 2,000 feet before leveling out in the Catawba Valley. The gorge's rim extends 3,400 feet, compared to the river's average of 2,000 feet. Plant communities range from lichens and shrubs on the cliffs to laurel and rhododendron along the riverbanks. In some spots, the gorge shelters stands of virgin timber. Photo credit: Brenda Wiley. All rights reserved by owner. Photo labeled for non-commercial reuse. Designated by Congress in 1984, the Middle Prong Wilderness has a total of 7,460 acres, all located in North Carolina. The Wilderness rests on high ridges southeast of Richland Balsam, a steep and rugged terrain forested with second-growth spruce and fir, and opened by grass-heath "balds" on the ridges. Mixed hardwoods cover the lower slopes. Elevations range from 3,200 feet on the West Fork of the Pigeon River to 6,400 feet near Richland Balsam. Numerous streams work their way down to the river. Only a road separates this Wilderness from Shining Rock Wilderness to the north. Designated by Congress in 1984, the Pocosin Wilderness has a total of 11,709 acres, all located in North Carolina. Native Americans called it a pocosin, which in their language meant "swamp on a hill." Toward the center of the waterlogged goo, trees thin and grow more stunted, and shrubs and vines diminish, their tangled roots providing the only footing. Thus you'll find the trailless Pocosin Wilderness in Croatan National Forest near the coast of North Carolina. Click here for a map of Croatan National Forest showing Pocoson Wilderness and other areas! Designated in 1984, the Pond Pine Wilderness has a total of 1,685 acres, all located in North Carolina. Pond Pine is the smallest of North Carolina's designated Wildernesses and is just south of Great Lake in the middle of Croatan National Forest. The lake is acidic, the Wilderness a trailless pocosin, and the few who visit are a hardy breed who can cope with the deep muck, alligators, biting insects, poisonous snakes, and tangled masses of vines and shrubs. People come to see the wildlife and plants, but they rarely stay long. In case you fancy yourself to be the exception to that rule, be forewarned that there are no campsites. Click here for a map of Croatan National Forest showing Pond Pine Wilderness and other areas! Photo labeled for non-commercial reuse. All rights reserved by owner. Photo credit: NC Orchid on Flickr. 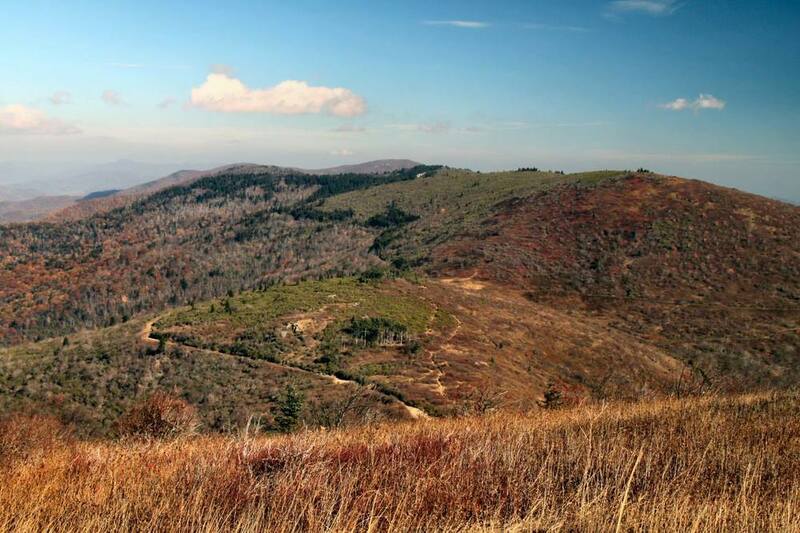 Designated in 1984, the Sheep Ridge Wilderness has a total of 9,297 acres, all located in North Carolina. All that remains of Sir Walter Raleigh's lost colony is the word croatan, Algonquian for "council town," carved on a tree on Roanoke Island. This raised bogland or pocosin lies in the heart of Croatan National Forest, with Catfish Lake Road to the north and Great and Long Lakes to the south. A high water table keeps the black muck of the pocosin wet and agreeable enough to grow dwarf swamp vegetation. Hazards include biting insects, poisonous snakes, and alligators. Click here for a map of Croatan National Forest showing Sheep Ridge Wilderness and other areas! Photo credit: Bill Gowan. Used with permission. All rights reserved by owner. Designated by Congress in 1964, the Shining Rock Wilderness has a total of 18,483 acres, all located in North Carolina. The Shining Rock Wilderness is bordered by the Middle Prong Wilderness to the southwest. Named for a micaceous rock outcrop, Shining Rock became one of the original components of the National Wilderness Preservation System in September 1964, a few months after garnering designation as a Wild area. It is now the largest Wilderness in North Carolina, separated by only a road from Middle Prong Wilderness to the southwest. Standing at an elevation of more than 5,000 feet and boasting five peaks exceeding 6,000 feet (three within the Wilderness boundaries), Shining Rock Ledge forms the backbone of this area. Photo credit: Johnny Molloy. All rights reserved. View more of his photos and books on his website. Designated by Congress in 1984, the Southern Nantahala Wilderness has a total of 23,473 acres. Georgia contains approximately 11,770 acres, and North Carolina contains approximately 11,703 acres. The Cherokee Indians thought of the Blue Ridge Mountains as the Great Blue Hills of God. These original inhabitants named the shady forests and deep, dark gorges Nantahala, or Land of the Noonday Sun. Steep, rugged, reforested country cut by numerous streams and old drainages characterizes the southern end of the Blue Ridge Mountains. The streams feed the Nantahala, Hiwassee, and Tallulah Rivers, and the wide non-Wilderness right-of-way along the Tallulah neatly divides the Georgia share of the wildland. Learn more about the Southern Nantahala WIlderness at wilderness.net. Photo courtesy of wilderness.net image library. Click image to find more great photos! Designated in 1976, the Swanquarter Wilderness has a total of 8,785 acres, all located in North Carolina. Access to most of Swanquarter Refuge requires a boat. One road, outside the Wilderness, leads to the refuge's 1,000-foot-long Bell Island fishing pier in the north west portion of the Refuge, off U.S. 264. More than one-half of the refuge has been designated Wilderness: Judith Island, Swanquarter Island, Great Island, Marsh Island, and portions of the mainland along Juniper Bay. Judith, Swanquarter, and Great Islands are entirely estuarine, dominated by black needlerush, intermittently under water usually due to wind tides. Learn more about the Swanquarter WIlderness at wilderness.net. Hat tip: Throughout this website, we use text and photos from wilderness.net. They gave us permission to do so because they are great! And because they are great, please check out their website, too!